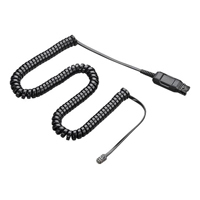 The Plantronics A10-16 Direct Connect Cord enables users to easily connect a Plantronics H-Series heasdset to most headset-ready phones if they are equipped with a headset port. The Quick Disconnect feature means that you can leave your workstation without removing the headset. 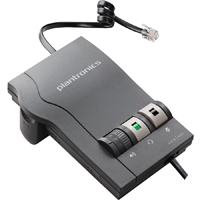 The On Line Indicator Light Accessory from Plantronics connects to Plantronics wireless headset systems. It provides a highly visible means of communicating to others that the user is currently engaged on a telephone call. The light notifies customers or coworkers that the user is unable to respond, eliminating unneccessary interruptions or distractions. The 66" cord enables the light to be mounted in an easily seen location. The Mirage H41 headset features a gently contoured earpiece which fits perfectly behind either ear, presenting a professional look with minimal visibility by eliminating the need for a headband. The voice tube technology ensures that callers hear you with clarity while the earpiece provides crisp incoming audio, ensuring easy conversation. The H41 headset is equipped with a 'quick disconnect' that enables you to move from your workstation without removing the headset. The Mirage headset requires a Quick Connect cable (see accessories) in order to connect to your phone's headset jack. Please provide your phone make and model when placing your order - that way we can verify compatibility with your phone system. 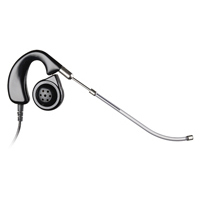 The EncorePro HW520 Binaural Headset from Plantronics is intended for use by those who may have limited hearing in one or both ears, or for deployment in noisy environments where ambient noise or adjacent conversations may prove to be a distraction. The over-the-head design directs incoming audio equally to both ears, aiding in overcoming hearing limitations. Large foam ear pads reduce pressure for all-day comfort while also serving to insulate the user from distracting noise. The adjustable noise-cancelling boom microphone ensures that outgoing audio is as clear as the incoming sound, ensuring clear communication. 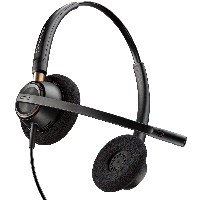 NOTE: The EncorePro HW520 headset requires a Plantronics Direct Connect Cord in order to connect to the headset jack on the phone. Please indicate the specific make and model of the phone the HW520 is to be used with in order to verify the compatibility of the HW520 headset. The Vista M22 Amplifier from Plantronics provides independently adjustable amplification for both incoming and outgoing audio. Amplification is available for both a standard handset as well as Plantronics corded headsets equipped with a Quick Disconnect. The Vista M22 Amplifier is compatible with the majority of traditional phones as well as new VOIP wideband systems. 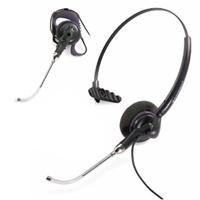 Users can switch between headset or handset usage or mute outgoing audio with a single touch. 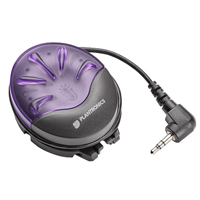 The top-mounted Volume Control wheel permits instant adjustment of incoming audio. If outgoing audio volume is too low this can also be adjusted using the included screwdriver. The Vista M22 is equipped with SoundGuard Digital Acoustic Safety Technology to provide superior quality for both incoming and outgoing Audio. For safety it also includes acoustic limiting to ensure that maximum safe decibel levels are maintained. For convenience the Vista M22 is powered by 2 AA batteries (included) or by an optional power supply. Note: In order to verify compatibility please be aware of both the Make and Model of the phone this is to be used with as well as the Model of Plantronics Headset (if being used with an existing headset). The H141 DuoSet Headset from Plantronics is a convenient, quality solution for users who want to have their hands free while carrying on conversations. The H141 comes with the ability to configure for either 'Over-the-Ear' or 'Over-the-Head' use, making it a practical choice for any user. Voice-Tube technology ensures that callers will hear you speaking with clarity while the earpiece provides consistently clear audio ensuring easy communication. The H141 headset requires a Plantronics Direct Connect Cord in order to connect to your phone's headset jack. Please provide your phone make and model when placing your order - that way we can verify compatibility with your phone system. Since the H141 Headset is now discontinued you may wish to consider the Plantronics EncorePro HW540 Headset which offers users three different wearing configurations.